Tektronix, Inc., the world's leading manufacturer of oscilloscopes, recently announced a series of enhancements to its USB 3.0 test solutions including an industry first transmitter test solution for the SuperSpeedPlus 10 Gb/s specification. Other enhancements include a new USB 3.0 oscilloscope-based layered decode capability and an enhanced automated solution for SuperSpeed USB transmitter testing that improves test throughput by up to 60%. With the faster data rates for USB 3.0 come new test challenges, most notably major increases in channel loss and reduction in signal to noise ratio as well as more complex link training and timing requirements that must be verified. As design margins shrink, it's more important than ever to have an accurate and standard specific measurement system available. All of these needs are fully met by the Tektronix SuperSpeedPlus USB test solution (option SSP). 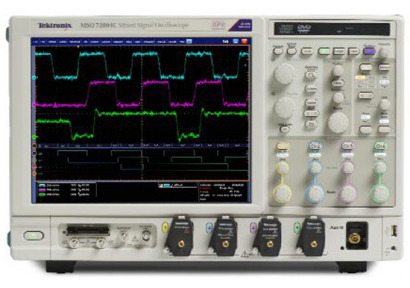 "Just as important industry standards such as USB 3.0 evolve over time, it's critical that our test and measurement tools evolve as well," said Brian Reich, general manager, Performance Oscilloscopes, Tektronix. "The latest enhancements to our USB solutions enable engineers to verify compliance to the latest versions of the USB specification, seamlessly decode bus operation speeding debug efforts, and dramatically reduce test times while conducting automated compliance tests. With tighter time constraints and more design complexity engineers need flexible tools that work across multiple layers of a bus to find problems faster. Tektronix USB 3.0 decode software simplifies debug with protocol-specific triggering, easy to use search and navigation, and multi-layer decode. This allows the user to easily navigate through the protocol stack, fully time correlated with the analog waveform on the same screen. "With over half a billion SuperSpeed USB products expected to be shipped by end of 2013, USB continues to be a leading interconnect for host and peripheral communication," said Jeff Ravencraft, USB-IF President and COO. "The support of leading test and measurement equipment providers such as Tektronix is critical to ensuring that our member companies are able to quickly bring certified USB 3.0 products and solutions to market." The new TekExpress USB 3.0 transmitter test software (Option USB-TX) and SuperSpeedPlus USB transmitter test software (Option SSP) will both be available for download on www.tek.com in July 2013. The new SuperSpeedPlus transmitter test software (Option SSP) will be available for download on www.tek.com in late July 2013. The USB 3.0 decode will be a free upgrade for customers with a DPO/DSA/MSO70000 Series Oscilloscope with option SR-USB which will be available in July 2013.